The line between the physical world and the virtual just got a little bit more blurred. 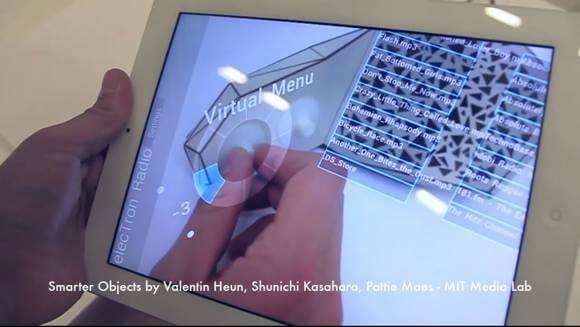 Smarter Objects is a program developed by MIT Media Lab’s Fluid Interfaces Group that connects virtual objects to real ones in a way that the real can be controlled with the virtual. Smarter Object combines the adaptability of digital interfaces with the ease of use of real world devices. To augment this reality, users point a smartphone at an object, like a radio. A Graphical User Interface (GUI) maps digital information onto the surface then an application recognizes the object and intuitively generates a graphical interface to control the object’s knobs and buttons or to be programmed from afar. What’s more, multiple Smarter Objects can be connected for a potentially limitless interface. Unlike the radio sitting on your nightstand, a Smarter Object radio can play your own playlist of mp3s. Select the songs you like drag and drop them on the station knob. Witness Smarter Objects in the following video. The GUI can work with anything that has knobs and buttons, and the GUI and TUI – tangible user interface – is connected through a server through WiFi so that modifying one modifies the other in realtime. They’ve already used Smarter Objects to open a door, control lighting and “touch” a sensor without actually touching the sensor. They’ve also surfed the airwaves on a radio. Like an iPod meeting a boombox, the radio’s functionality is combined with playlists and online music sources. But say you don’t like Pandora but you still want variety. Multiple Smarter Object radios, such as another with a better speaker, can be linked through a feature called “tagging,” which is as simple as drawing a line with your finger between the two. The usefulness of some possible combos might be questionable, but their coolness isn’t. The volume know of a radio can be connected to the speed button of a blender, for instance. But one could also link the coffee maker power button to an alarm clock. And virtual objects can be added to the GUI space to give real objects functionality they never dreamed of. The clock connected to your coffeemaker could be virtual, and your Facebook page could be connected to your light switch to turn on every time there’s an update on your newsfeed – as if you weren’t about to check anyway. For those of us having trouble figuring out how much easier Smarter Objects can make our lives, the developers describe several scenarios. It can lend a helping hand in the kitchen by programming the oven, food processor, and, if you’re like me, the microwave to operate at settings that the recipe needs or that worked the last time to give the Alfredo sauce just the right consistency. For smarter cars, Smarter Objects can also customize temperature and entertainment settings to each driver, and for those who like yard work, riding lawnmowers can be turned into Smarter Objects and their blade speed and mowing patterns can be preprogrammed and their gas levels monitored. Google Glass augments objects with information, Smarter Objects augments them with functionality. It’s probably only a matter of time before the two are combined and we’re able to enhance the functionality of all objects we encounter, and the line between virtual and real worlds grows even more tenuous.